These release notes describe the new features, improvements, and fixed issues in Web Help Desk 12.5.1. They also provide information about upgrades and describe workarounds for known issues. WHD 12.5.1 offers new features and improvements compared to previous releases of WHD. 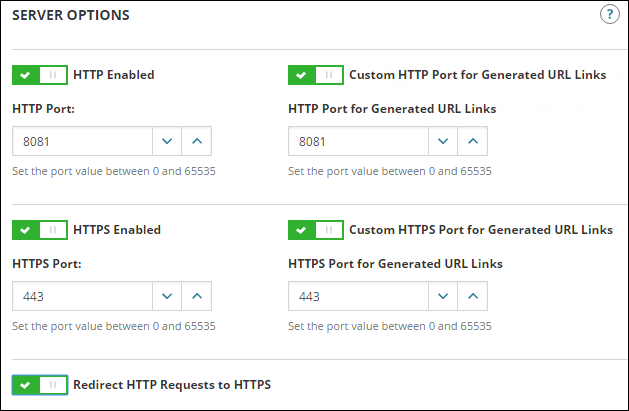 To ensure that all incoming requests use a secure connection, you can redirect HTTP requests to the HTTPS port. When enabled, all incoming requests redirect to a secure HTTPS port. Click Setup > General > Server Options to access the interface. The new user interface offers a roomy, clean visual design that eliminates visual noise to help you focus on what is important. By default, Web Help Desk creates a Java KeyStore when you install the software. 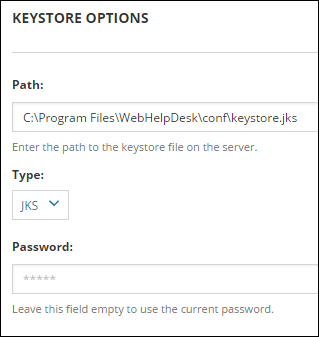 Using Keystore Options, you can create a custom JKS to share certificates with other applications or create a PKCS12 KeyStore to store a certificate created using OpenSSL. The Certificates setting allows you to view the SSL certificates in the KeyStore that provide a secure connection between a resource and the Web Help Desk Console. If the resource (such as an Apache Tomcat® web server) requires a key pair and a specific alias name, you can edit the alias name to enable the secure connection. You can also add and delete certificates as required. Click Setup > General > Certificates to access the interface. 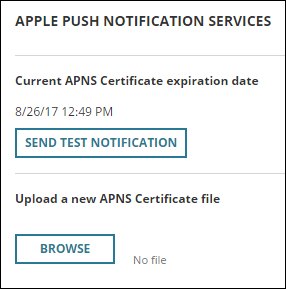 APN enables Web Help Desk to send notifications to an Apple device running Web Help Desk Mobile and a supported Apple iOS. When enabled, the device receives SMS text messages each time a customer ticket is created or updated. See Purchase and activate a SolarWinds Web Help Desk license for more information. Beginning with this release, Web Help Desk no longer supports Windows Server 2008 (32- and 64-bit). SolarWinds recommends that you upgrade to Windows Server 2008 R2, 2012, 2012 R2 or 2016 at your earliest convenience. Beginning with this release, Web Help Desk no longer supports Microsoft Hyper-V Server 2008 R2. SolarWinds recommends that you upgrade to Hyper-V Server 2012 R2 SP1 or 2016 at your earliest convenience. Use the SolarWinds Product Upgrade Advisor to determine your upgrade path. Based on your current environment and versions, the Product Upgrade Advisor provides an ordered list of how to proceed with the upgrade. Web Help Desk and other modules (NPM, SAM, NCM, NTA, etc. ), see Upgrade Multiple SolarWinds Products. Web Help Desk as a stand-alone product, see Upgrade a Single SolarWinds Product. Each guide includes checklists and instructions to help you plan and execute your upgrade. When you are ready, download the upgrade package from the SolarWinds Customer Portal. The SolarWinds Web Help Desk software installer includes Apache Tomcat 7.0.77, which provides enhanced security and is required for this release. When you upgrade your Web Help Desk software, the upgrade procedure replaces the SolarWinds Web Help Desk software installer includes Apache Tomcat 7.0.77, which provides enhanced security and is required for this release. When you upgrade your Web Help Desk software, the upgrade procedure replaces the (WebHelpDesk)\conf\tomcat_web_template.xml file with an updated file that includes the Tomcat 7.0.70 settings. WHD 12.5.1 fixes the following issues. FAQs that include special characters now load correctly. 1103687 An error no longer occurs when upgrading Web Help Desk to the next release. 1092500 Deleted reports no longer remain in a report group. 1089738 The Web Help Desk Administrator Guide was updated to address asset discovery correctly. You can now delete an FAQ created from a ticket note. Running Web Help Desk with Microsoft® Internet Explorer® in Compatibility View no longer generates an error. A ticket report now aggregates tickets from sub-request types. The Department field is now inherited in a child ticket. 937237 The Calendar no longer displays Saturday as "Undefined". 882023 Mozilla® Firefox® now displays the correct page title in a browser window. Custom fields no longer remain in a ticket after changing the Request Type. The Bulletin Board Code (BBC) ticket link in ticket emails is no longer broken. 403944 Tickets with surveys no longer require an extended amount of time to close. 1085509 You can now select a Location with an extended name in Ticket Details. An issue with using Bulk Actions is resolved. N/A A security issue was resolved to prevent a Denial of Service (DoS) attack. N/A A security issue was resolved to prevent Web Help Desk from being indexed and displayed in a Google search. 12.1 and earlier November 17, 2016: End-of-Life (EoL) Announcement - Customers on Web Help Desk version 12.1 or older should begin transitioning to Web Help Desk version 12.5 and above. February 17, 2017: End-of-Engineering (EoE) - Service releases, bug fixes, workarounds, and service packs for Web Help Desk version 12.1 or older will no longer actively be supported by SolarWinds. February 17, 2018: End-of-Life (EoL) - SolarWinds will no longer provide technical support for Web Help Desk version 12.1 or older.